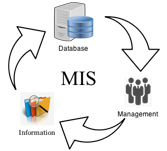 Management Information System (MIS) is a system which collects the data that is stored, disseminates and executes in the form of information which is needed to perform specific functions of management. This tutorial mainly gives the concepts related information and other major enterprise-level systems. It also gives the detailed information about MIS and you will able to know how the enterprise-level systems help in the decision-making process, which is very sophisticated to any business enterprise. management, science, commerce and arts where management Information System is included in the curriculum as an introductory course so that students can acquire basic knowledge about the course. Knowledge of computers is not mandatory to follow the contents of this tutorial. This tutorial does not require any background in computers or computer programming. It is very helpful for the students who have a basic knowledge of computer terminologies because it becomes very easy in understanding the given concepts.